Here is the SARILAYA statement to open its observance of the 2016 National Women’s Month. 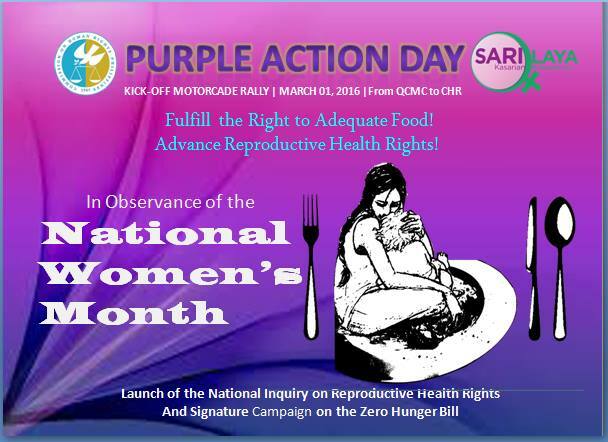 In commemoration, there will be a launch of an INQUIRY ON REPRODUCTIVE HEALTH RIGHTS. The event will be held in a few hours today (March 1, 2016), at 6:00 a.m., Tuesday morning, ends around noon. The venue is the Quezon Memorial Circle. "The Filipino nation opens today the 2016 celebration of women’s month in the country. Here at the Quezon Memorial Circle, we are holding thus motorcade rally to reaffirm our commitment to work for solutions to the burning women’s issues of our times. SARILAYA is honored to co-convene this event with the Commission on Human Rights, and we are delighted that we are joined here by representatives of several Women, human rights, and environmental advocacy groups such as Engenderights, the Food first Information and Action Network (FIAN), Greenpeace-Philippines, Likhaan (Center for Women’s Health), the Philippine Alliance of Human Rights Advocates (PAHRA), Philippine Commission on Women (PCW), World March of Women, and the UN Fund for Population Activities (UNFPA). We are also pleased to welcome to our ranks some national, local government officials, and faith-based groups, who like us, want to put an end to Hunger, poverty, gender-based violence, and other various forms of women’s rights violations." Why Highlight the Need to Combat Hunger this Women’s Month? The country’s Global Hunger Index (GHI) was reported by the International Food Policy Research Institute (IFPRI) to have constantly dipped over the last 25 years―from 30.7 in 1990 to 28.9 in 1995 to 26.2 in 2000 to 22.1 in 2005, and 20.1 in 2015. However, as less than 5 is the ideal score, the IFPRI 2015 report categorizes the Philippines’ hunger problem as continually serious. The GHI scores are calculated using a scale of 0 (no hunger) to 100 (hunger), and a recently enhanced formula that reflects the multidimensional nature of hunger by combining four indicators related to undernourishment, wasting, stunting, and child mortality. Most recent results of the Social Weather Station’s self-rated hunger survey provide further evidence of the continuing severity of the hunger problem in the country―15.7% or 1 of 6 Filipinos interviewed face-to-face reported that they suffered involuntary hunger during the 3rd quarter of 2015. This was only three months after the incidence of involuntary hunger dropped to its lowest level in 10 years―12.7% or 2.8 million families in June 2015. The 2013 National Nutrition Survey conducted by the Food and Nutrition Research Institute revealed that not much had changed in the nutritional status of Filipino children from when it was taken five years before. The number of 0−5 year olds who are wasted, or too thin for their height, increased from 6.9% in 2008 to 7.9% in 2013. Those who are stunted, or too short for their age, slightly decreased from 32.3% in 2008 to 30.3% in 2013; while those who are underweight fell from 20.7% to 19.8% during the same period. As this age group marks a crucial stage for mental and physical development, poor nutrition among these children can have irreversible health impacts that may extend to adulthood. Not differently, the prevalence of nutritionally-at-risk pregnant women in 2013 remained high at 24.8%. Undernutrition among lactating mothers stood at 12.5%. These have serious implications for the health and development of newborns and children, as we all know, nourishment is most critical for a child’s wellness during the first 1,000 days since conception. Because of their traditional role as family and community caregivers, women bear the brunt of the adverse impacts of hunger and malnutrition on health. Caring for the sick adds to their burden, and aggravates the conditions of stress, fatigue, and time poverty they more heavily bear than men within the household. It also increases their exposure to health risks, and in resource-strapped households can lead to even greater levels of hunger and deprivation among them whose needs are usually subordinated and sacrificed especially in times of crises. The discrimination they face not only exposes women to material deprivation. It also makes it more difficult for them to fulfill their vital roles in food production, preparation, processing, distribution, and marketing. This can tremendously constrain society’s capacity to feed itself and be food-secure, which in turn can lead to productivity losses as well as impair the health and well-being of present and future generations. Challenging the constraints women confront and enlarging their access to opportunities should therefore be integrated in the fight against hunger and malnutrition. Conversely, freedom from hunger should be a constant goal of women aspiring to exercise and fully enjoy their rights and entitlements, equally with men, in all aspects of their day-to-day living. Availability, accessibility (economic and physical), adequacy, and food safety are built into the abovementioned precepts. An added dimension is sustainability, which is crucial to ensure inter-generational equity. SARILAYA anchors its core intervention, SARI-LINGAP, on these two precepts. SARI-LINGAP is essentially about empowering women to take care and regain control of their health and those of their families and communities through a holistic preventive approach that rests on two pillars―the production and consumption of organic food, and the use of traditional and alternative approaches to wellness and healing. Promotion of sustainable agriculture and sustainable livelihood systems, and networking and advocacy for responsive governance are also integral components of SARI-LINGAP. These are meant to boost the availability, accessibility, and sufficiency of organic food and herbal health remedies in the program areas. Meager incomes in the face of spiraling food prices have increased poor women’s reliance on cheap ready-to-eat food laden with PASTE (preservative, artificial, and synthetic taste enhancers) proven to have harmful side-effects. As women are largely unaware of these side-effects, proper education is needed to wean them away from unhealthy food practices. But education alone will not suffice for healthy food practices to become the norm in poor households and communities. Direct cultivation of organic food sources should be encouraged and provision of various forms of support―for example, seeds, gardening spaces, tools, and more―will help in promoting this. Besides organic food production and preparation, provision of potable water and sanitation facilities will help further clean and healthy living. Rural women’s lack of ownership of land and other productive assets continues to be a major hindrance at enabling them to effect changes in crops and production systems in support of propagating sustainable agriculture and healthy food systems. This also limits their ability to rebalance decision-making power within the household, and raise their status in their families, communities, and as citizens. Review and elimination of discriminatory provisions in existing land laws, as well as acceleration of the agrarian reform program bestowing women with equal ownership rights as men are a must. So is the systematic incorporation of gender dimension in rural development projects and other support schemes. Besides adopting and implementing disaster risk reduction strategies, programs, and plans, climate change adaptation needs to be systematically planned and undertaken in the most vulnerable sectors of fisheries, agriculture, and forestry. Introduction and establishment of water conservation systems and technologies, and propagation of agro-ecological farming systems have been seen by SARILAYA to be badly needed in many of its partner communities and nearby areas. Support community women’s initiatives, including those of SARILAYA chapters and partners, to promote a holistic preventive approach to healthcare, propagate sustainable agriculture, and strengthen the resilience of vulnerable communities and livelihood systems through the integration of climate change adaptation and disaster risk reduction. Hasten the enactment of the Zero Hunger Bill. Ensure the consistent implementation of all laws promoting women’s rights including the Reproductive Health Law and the Violence against Women and Children Law. Accelerate the indemnification of all human rights violations under martial law. Mete out justice/punish all violators of women’s rights laws.